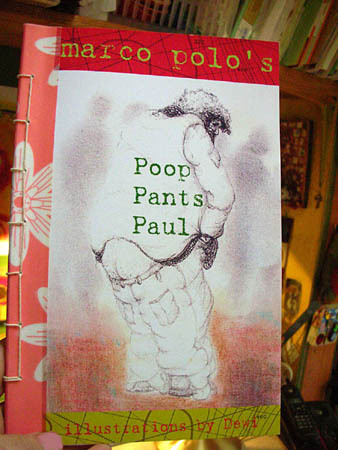 'POOP PANTS PAUL' is all about atmosphere, feelings. It's a story about how kids from the 'burbs' look at the homeless street people. Starting with a bet a homeless man tries to explain his life to these school kids who are 'on assignment' for their English class but have stepped 'beyond the bounds' and entered the seedy side of town - Queen west. A sad, humourous tale of redemption, pain, affection, life and near death as the homeless struggle to live in the timeless street of big city, Canada. POOP PANTS PAUL uncovers the nit&grit of life on those sometime mean sometimes easy streets written from the inside out with a hard honesty, tenderness, wit and wisdom. There are few books like this one. Bukowski reinvented for the 21st century - emotional stories of abuse & neglect of all kinds by someone who's been there/done that - MARCO POLO has seen it all and then some. He's a homeless traveller who sees his world as it is.